Peter Trott, Hon Peter Garrett MP, Leonard Andy, Peter Rowles and Dr Helen Larson celebrate the purchase of Lot 66 (photo Jeff Larson). Thanks to the efforts on local conservationists at Mission Beach, cassowaries can now enjoy wandering through a 25ha block near Wongaling Beach safe in the knowledge that it is protected as a part of a local wildlife corridor. 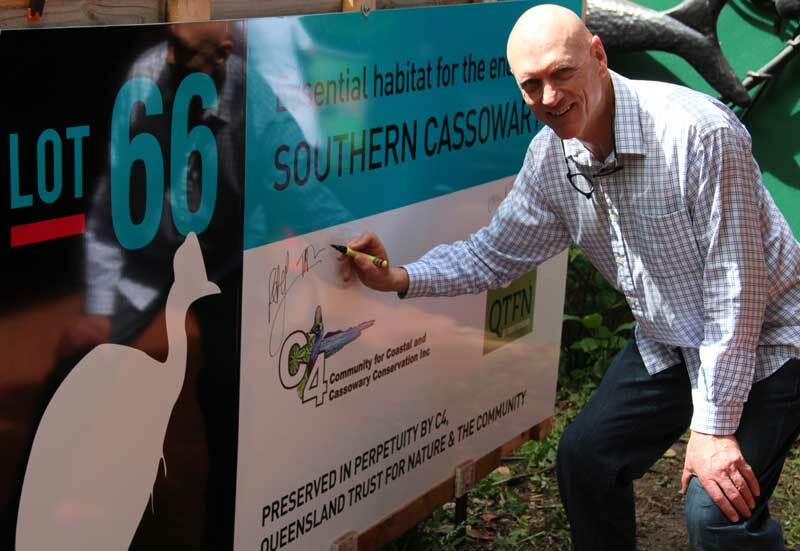 The Community for Coastal and Cassowary Conservation (C4) and the Queensland Trust for Nature (QTFN) have worked together to purchase the property known as Lot 66, a popular area of cassowary habitat. Together with the adjacent Lot 802 which the local council has designated a wildlife corridor to be managed by the the Djiru Warangburra Aboriginal Corporation, Lot 66 forms part of an important wildlife corridor from the Wet Tropics World Heritage Area to the coast. Lot 66 will be surveyed, its condition improved and a suitable house site designated before it is resold as a Nature Refuge. You can read all the details of how Lot 66 was purchased on the C4 webpage and in the link to the special bulletin about Lot 66. This entry was posted in cassowaries in the news, connectivity, CRT news, Mission Beach and tagged cassowaries, cassowary conservation, landscape connectivity, Mission Beach by cassowaryrecoveryteam. Bookmark the permalink.